As the owner of a small business, you’re obviously strapped for time. If you can’t keep up with all the changes and new products Google has for both users and businesses, you’re not alone. Unless you live in one of the test areas, it’s possible you don’t know about a service Google has been slowly expanding and beta testing in a few select markets, called Google Home Services. Right now Google only offers the program in a few markets, including the San Francisco Bay Area, Stockton, Sacramento, San Diego, Los Angeles, and Philadelphia. But Google has plans to further expand the program later in 2017, but it’s not clear where that will be. But no matter where or when Google next introduces its Google Home Services program, as a small business owner, you need to know if this latest Google product might be right for your business. What is Google Home Services exactly? But what is Google Home Services exactly and what does it mean for you, the small business owner who’s already bombarded with sales calls from marketing companies trying to get you to purchase more ad space on Google, Facebook and other channels, not to mention optimize your SEO (whatever that means – it stands for Search Engine Optimization by the way. I know, why can’t marketers just say so)? And you probably already have Pay Per Click (PPC) campaigns and/or local search ad campaigns running to attract more customers in your local area, so why should you pay for yet another advertising service from Google? Because you’re busy running your business and this topic is already complex enough, for the sake of time, let’s just compare PPC ads in Google AdWords and the new Google Home Service Ads. It’s aimed at small local businesses who provide services at or inside a customer’s home. For example, if you’re a plumber or you own an air conditioner repair business, your Home Service ad would be visible to potential customers searching for plumbers, or HVAC repair near me. Google Home Service ads appear at the top of Google search results. So what exactly does Google mean by top of the page? Do they mean directly under the PPC advertising (those are the listings with the tiny Ad logo at the top of Google search results)? No. Google Home Service ads appear above the PPC ads. To potential customers the Home Service listings don’t look like ads. There is a tiny bit of text that reads “sponsored,” in the top right corner above the three listings, but it’s not obvious and I didn’t notice it the first few times I looked at listings in one of the target areas. That means your business can potentially be seen first in customer search results, and these are quality leads because they’re customers in your area searching for the exact services your small business provides right now, not people who were on a competitor’s page yesterday, or who are doing research for a school paper, or who bought a product from a big box hardware store that’s related to the service you provide. Home Service ads get you calls from local customers searching for the exact services your small, local business provides. With Google Home Services, a potential customer searching for your services will see your Google Home Service listing at the top of the page, and click on it to see your business’ Home Service Ad where they can choose to call your business or contact you by filling in their contact information. Your customer never leaves Google and your ad is reaching customers who have an immediate need for the services you provide. Google only charges you for the phone calls or contacts you receive from a customer clicking on the Home Services ad. So if a potential customer clicks on your Home Services ad, but doesn’t contact you, Google doesn’t charge you. With Home Service ads, Google charges you per lead, not per click. At this point you might be wondering what exactly the difference is between a Home Services ad and a Pay Per Click (PPC) Ad. Don’t feel bad. It’s confusing, partly because digital marketers are fond of jargon and partly because the number of paid advertising options has increased. Google alone has search ads, display ads, video ads, app ads, and now Google Home Service ads. But search ads, display ads, video ads, and app ads all fall into the Pay Per Click category. A Pay Per Click (PPC) ad is charged exactly like it sounds. You pay Google when a customer goes to a landing page on your small business website by clicking on your ad in Google search results. They don’t even have to contact or call you. With Home Service ads, Google charges you per lead, not per click. With Pay Per Click (PPC) ads, Google charges you per click so you may be paying for clicks, not leads. Where your Pay Per Click ad appears in Google search results depends on a couple factors including your maximum bid on the keywords and your ads quality score. The quality score is the metric Google uses to determine the relevancy of your ad to the searcher. A kind of invisible split second auction takes place every time a user searches for the keywords your ad is targeting, and when they visit other websites that are related to those keywords. Depending on the type of small business you own, your ad could be competing against big businesses with huge advertising budgets. That’s why some keywords are harder to rank for than others going on just the amount of money spent, but you might be able to compete with the big guns if your ad has the highest quality score in spite of being the lowest maximum bid. PPC ads are partly based on how much money you can bid on specific keywords. It’s not impossible to run your own PPC campaigns, but as you can tell from this very condensed explanation, PPC strategy can get very complex quickly and when your budget is small, creating a high quality landing page, using the most relevant keywords, including testing different versions can get time consuming. So if learning how to run your campaign and running it is time you don’t have, then hiring somebody to run it for you is a good idea. Just make sure they’re Google Partners and that they will give you a personalized campaign, not the same PPC packages they give everybody else, with the same strategy that’s dependant on a package price and not your advertising budget and your specific business. Home Service ads are based on your reputation, reliability, location and the services you provide. Where Google displays your Home Service ad in users’ search results does not depend on bids or competition based on how huge your advertising budget is. Google Home Service ads are based on your reputation, reliability, location, and the services you provide. Some of those criteria sound mighty subjective, but Google does have metrics it uses to determine your business’s reputation and reliability. Specifically how Google ranks where your business will appear in search results is determined by how close your business is to the potential customer, your business review score on Google, how many review scores individual customers have given you, how responsive you are to customers, the hours of your business and whether or not customers have filed serious or numerous complaints about your business with Google. Google also has an additional feature called Google Guarantee that you can add to Google Home Services. But hopefully they will decide to make this option available to more types of businesses once they officially launch the Home Service program. A Google Guaranteed business is licensed, insured and has passed a pre-screening process that includes employee background checks. So what is a Google guarantee and how does it work? In a nutshell, a Google guaranteed business is licensed, insured and has passed a screening process through Google’s outside vendor at the business’s expense, including a background check for the business owner and their employees. If you pass Google’s criteria for being guaranteed, then your Home Service Ad will display a logo that reads, “Google guaranteed” next to a green checkmark. When potential customers click on your Home Service Ad, the Google guaranteed section of your ad is expanded to display a brief explanation of what a Google guarantee means. Google provides $2,000 in coverage for Google Guaranteed business jobs booked via a Home Service Ad. Any business that has passed the additional requirements, Google will guarantee their work for up to $2,000. That means a dissatisfied customer can contact Google customer support and submit a claim. After that Google customer support will investigate the claim and make a decision on the claim. The guarantee is only for jobs booked through a Google Home Service Ad. Any future work, unless the existing customer books through a Home Service Ad again, isn’t covered by the guarantee. A Google guarantee logo displayed on your Home Service Ad could increase your leads by as much as 1800%. Ok so as a small business owner who provides in home services to local customers, once Google rolls out the Google Home Service program in your market area, would it have any value in growing your business? Absolutely! In fact, according to this video by Mondovo, businesses participating in the beta version of Google Home Services that are Google guaranteed have seen up to an 1800% increase in leads as a result. That’s because to customers, that green check mark and the Google name are strong indicators that your business is trustworthy and reliable. Essentially, your small business benefits from the power of the Google brand. Non Google guaranteed businesses could disappear from Google search results entirely. Conversely some businesses in the test market areas who aren’t participating in the program, have seen their services disappear from Google search results altogether. That means if you’re a small business who provides home services to local customers and you have more than a couple competitors, once Google expands its Home Services program to your area, in order to appear at the top of a potential customer’s search results, you’re going to have to opt into the Home Services program and take the extra steps to become Google guaranteed. Your next question is probably if Google Home Service ads can replace your PPC Ads on Google. The answer is: It depends. Google Home Service ads target an extremely specific stage of your customer’s buying journey, the immediate decision stage. They’re customers who have an immediate need for your services, for example a homeowner with a burst pipe or a person who got locked out of their home. PPC ads can target different stages of your customer’s journey from awareness to decision, and usually are more geared towards customers looking for information on specific services who don’t necessarily have an immediate need. It really depends on your business, the local area where you live and the type of competition in your area as well as your budget. Can Home Service ads replace PPC ads? It depends on your business and your budget. Some small businesses might not need PPC ads, and if your advertising budget is extremely limited, you might benefit more from investing in Google Home Service ads and foregoing PPC ads altogether. In my opinion, you could probably get away with focusing on Google Home Service ads and Google guarantee, plus your company website and Search Engine Optimization (SEO). The bottom line is it’s really too soon to tell exactly what Google Home Services will ultimately look like once Google offers it everywhere. Google is still beta testing and as they add new markets and new business categories, the program itself will ultimately evolve even more before the program is officially launched. You can’t afford to ignore the significant increase in growth that Google Home Service ads could mean for your small business. 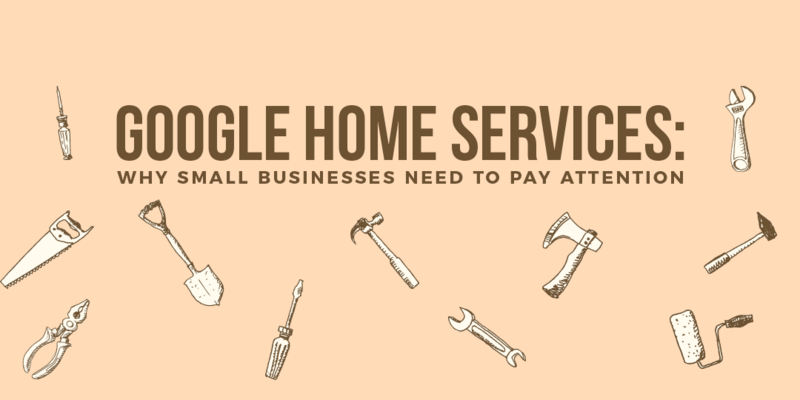 However, given what we know already about the program, if you’re a small business owner who provides in home services, you can’t afford to ignore the significant increase in the growth of your business that adding Google Home Service ads to your small business marketing strategy could bring once Google introduces the program in your area. We want to know what you think about this potential new Google service? Let us know in the comment section. Google Home Services is a new and evolving program. As we learn more, here at BizIQ, we’ll inform you on how you can benefit from this service so watch this space for updates. In the meantime if you have any questions about PPC advertising, small business websites, SEO or anything else related to growing your small business, don’t hesitate to contact us today.